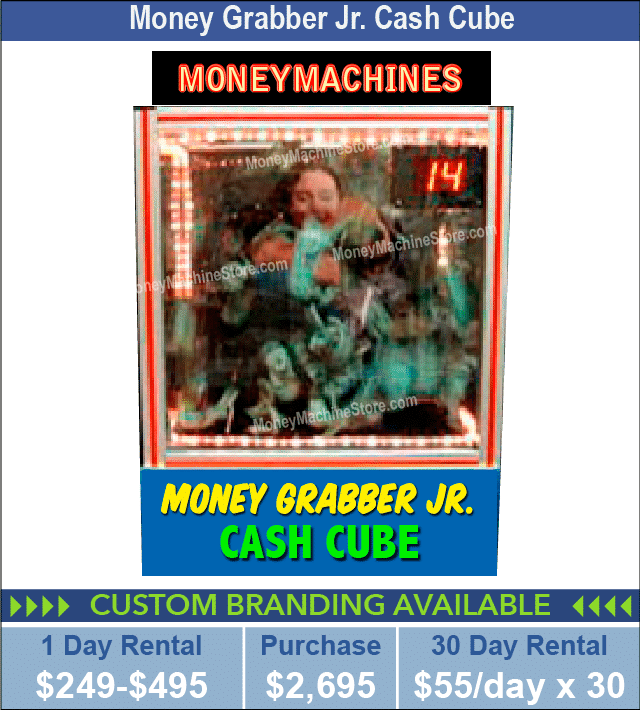 Rent a Money Machine Cash Cube! Choose from over 20 Models Below! Companies like yours use our money blowing machines as the ultimate event marketing weapon throughout Texas, including Dallas, Fort Worth, and Houston. 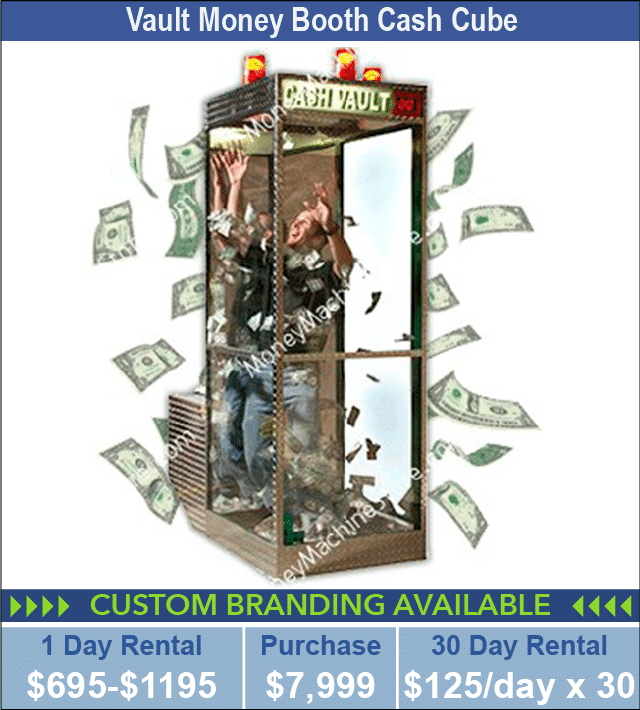 Here’s your chance to explore the magic of our cash cube money machines for your company. Reap the benefits of these essential marketing machines and receive the best ROI your advertising dollars can buy. 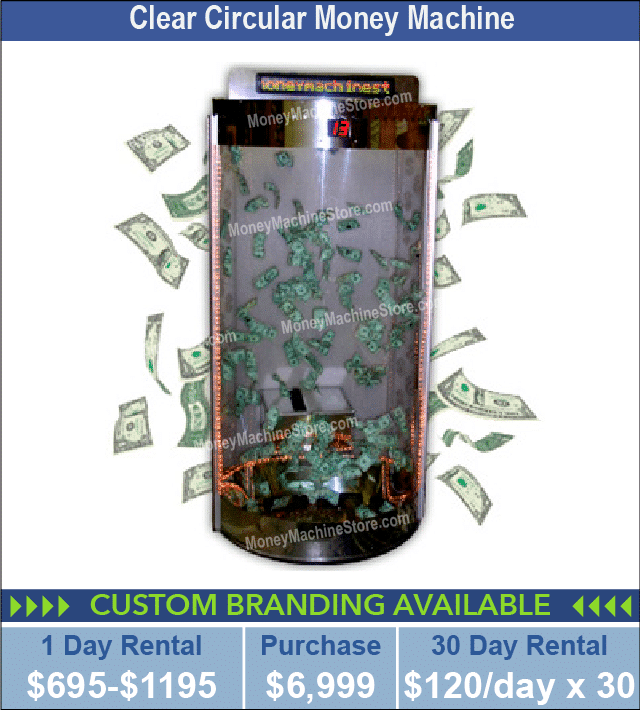 From Dallas to Fort Worth to any city in Texas, The Money Machine Store has been serving companies like yours with top quality, customized mind-blowing money vaults. 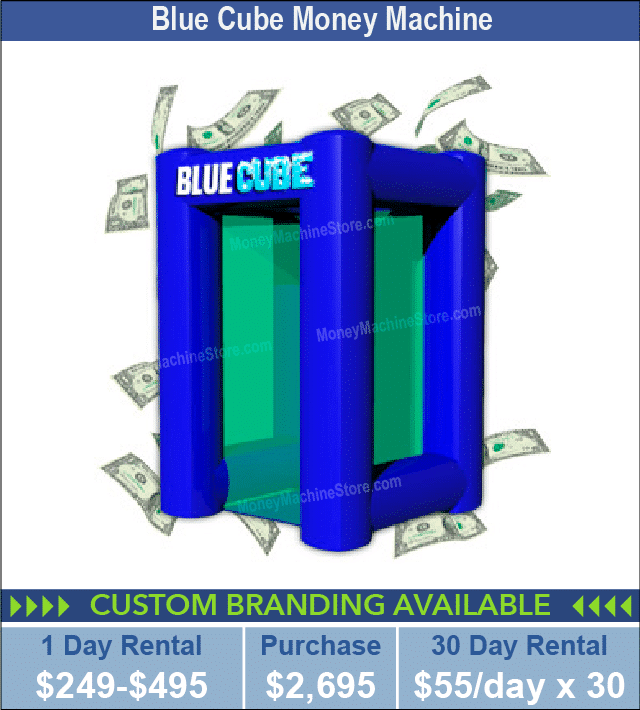 Our money cubes are perfect for any promotional event to attract crowds and give you the ROI you want. Potential customers will gravitate to your company’s storefront, tradeshow booth, or any event venue you attend. Serving companies like yours throughout Texas for over 30 years, The Money Machine Store helps you take your sales or employee productivity to the next level. 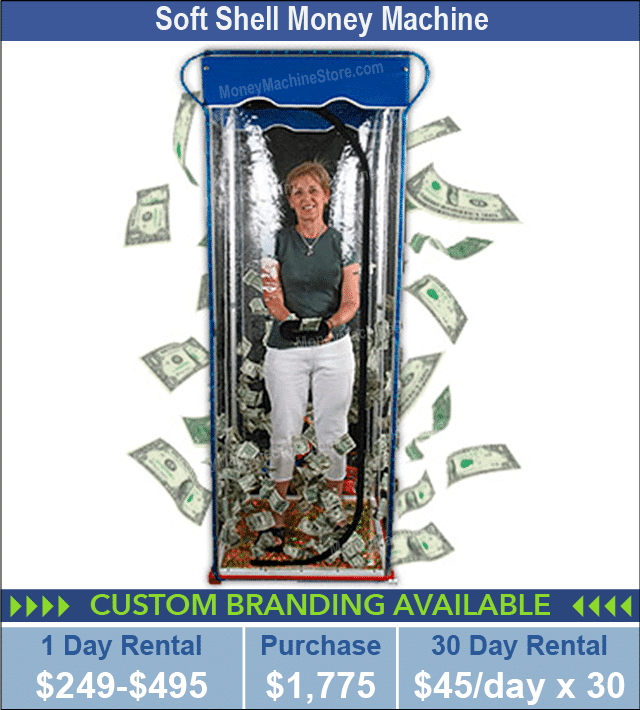 Great for casino promotions, tradeshow exhibits, fundraisers, music and sporting events, employee morale-boosting events, or any other promotional event you can imagine, our custom-branded money blowers create big crowds, lots of fun and excitement, and best of all, numerous potential customers. Walk into any casino or convention center and you’ll find one of our interactive cash cube money machines giving away cash, vouchers, coupons, gift certificates, or any other paper promotional gift you want to offer. Go to Kae Bailey Hutchison Convention Center in Downtown Dallas, for example, and look for the crowd. There, you’ll find people not only winning in the cash cube, but they’ll also be talking to you about your business and what it has to offer.  Our track record is one of success. We’ve proven that our cash cubes create such a stir that it’s only inevitable that you’ll make money. 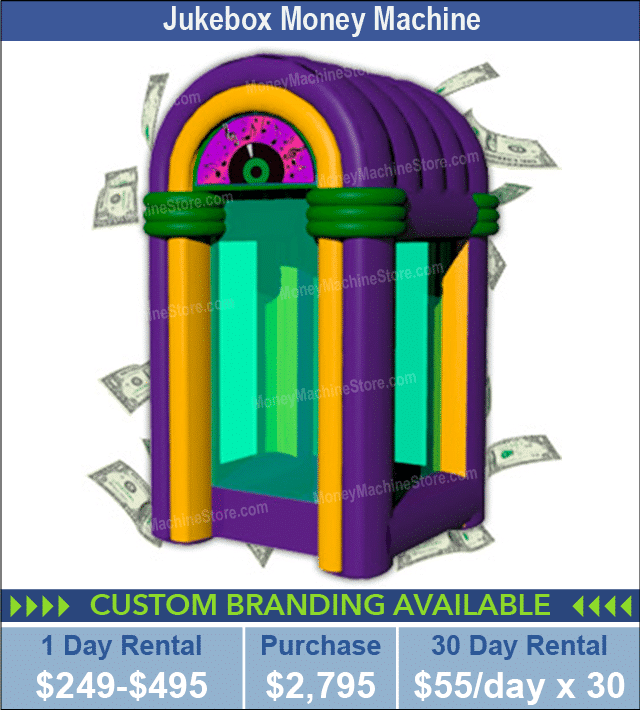 High sales and profit – that’s the result you get when you rent or buy one of our crowd-pleasing hard case or inflatable money booths. 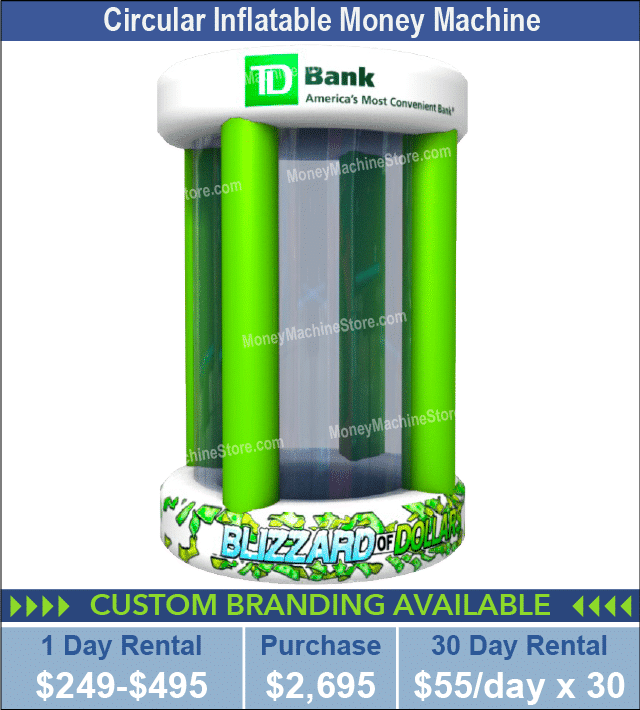 Today’s featured money vault is The Blizzard of Dollars® Cash Cube Money Machine – As Seen on TV. 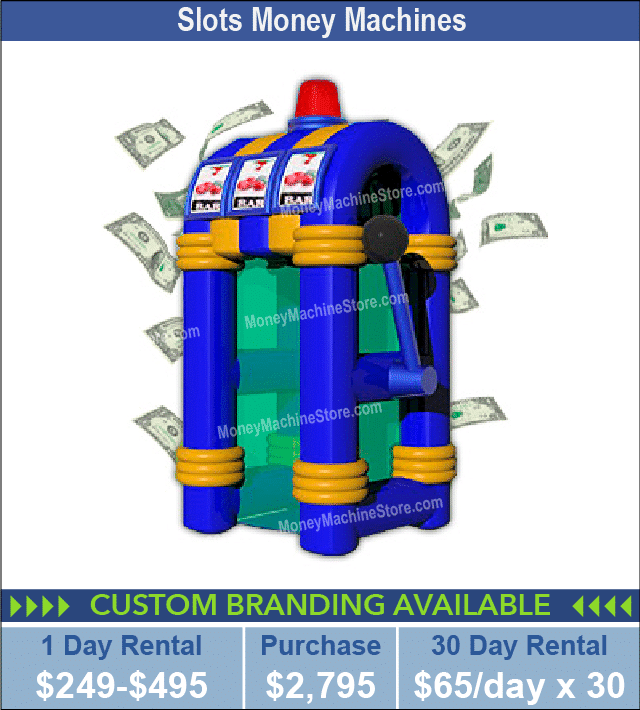 This hard case money booth has all the bells and whistles you want to bring in a large crowd to your event. 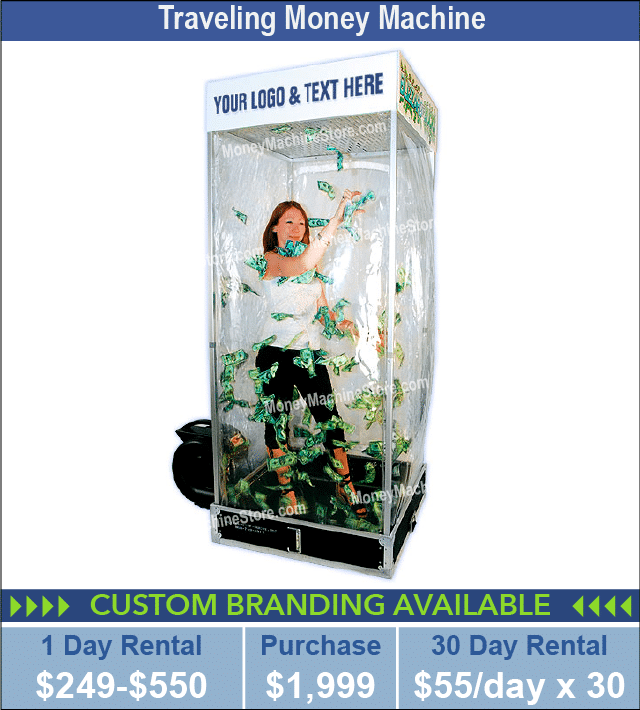 Getting potential customers to your booth or table is a breeze with this crowd-pleasing money machine. No one will be able to resist going to the lights, sounds, and money blowing around – giving you the chance to talk up your company and make sales. 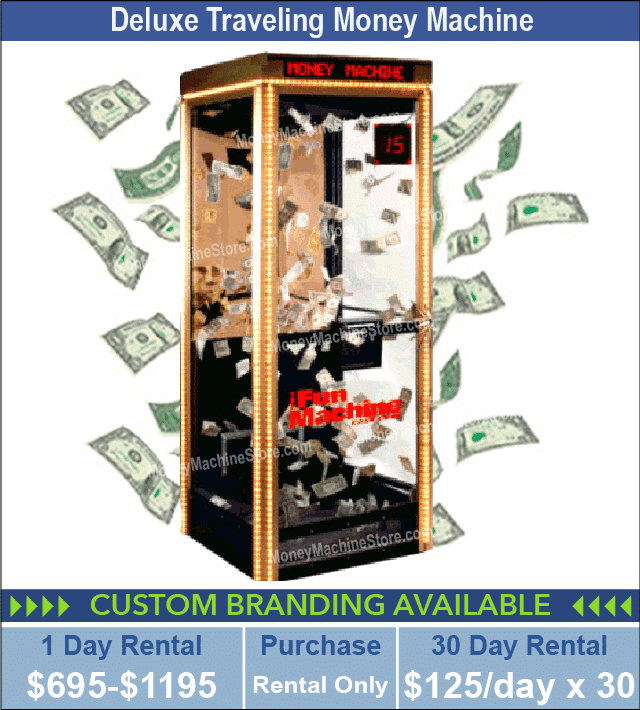 You have our guarantee of success when you rent or buy one of our Blizzard of Dollars® Cash Cube Money Machine or any other money cube we rent or sell. There are no other promotional products on the market that compare to the quality of this money vault. It’s a unique way of promoting your business with entertainment, enthusiasm, and an unforgettable experience. Our goal is to make your event booming. 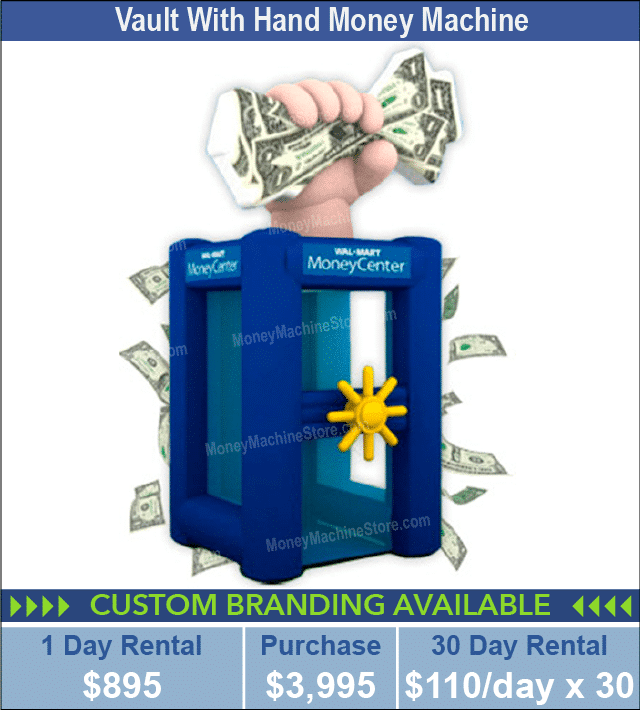 Whether you rent or buy one of our cash cubes, we can easily customize it to match your particular brand. Not only are they easy to use, but they’re also easy to transport. And, we deliver anywhere in Texas, including Dallas, Fort Worth, and Houston. One exceptional quality of our money booths is that the cash, vouchers, coupons, gift certificates, or any other paper promotional gift you choose won’t get bunched up at the bottom. 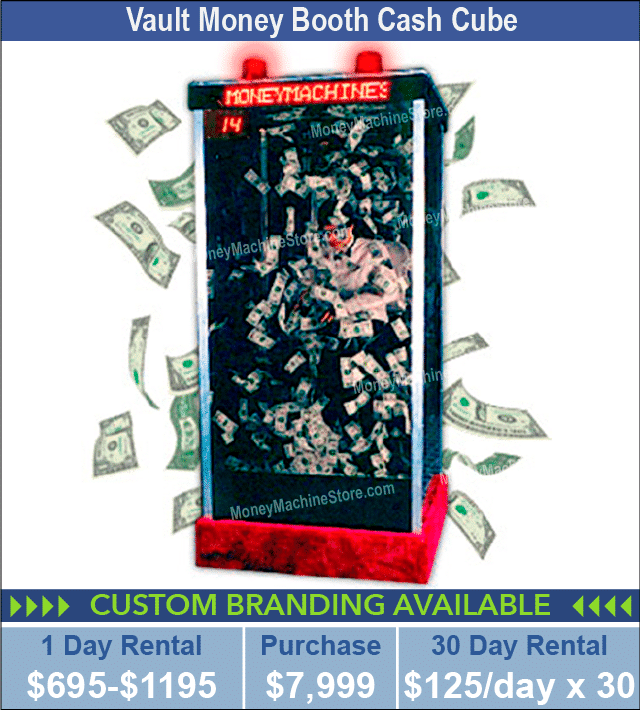 Meaning, any money machine you rent or buy from The Money Machine Store creates a circulating airflow, so your gift moves to the roof of the device, allowing participants to grab quickly. Imagine a blizzard. Now, imagine a blizzard of whirling money. Now you have a crowd. The funds will entice participants like no other promotional marketing tool. You will exceed your past marketing efforts with any of our ultimate marketing machines. Shatter sales and attendance records from recent marketing events. 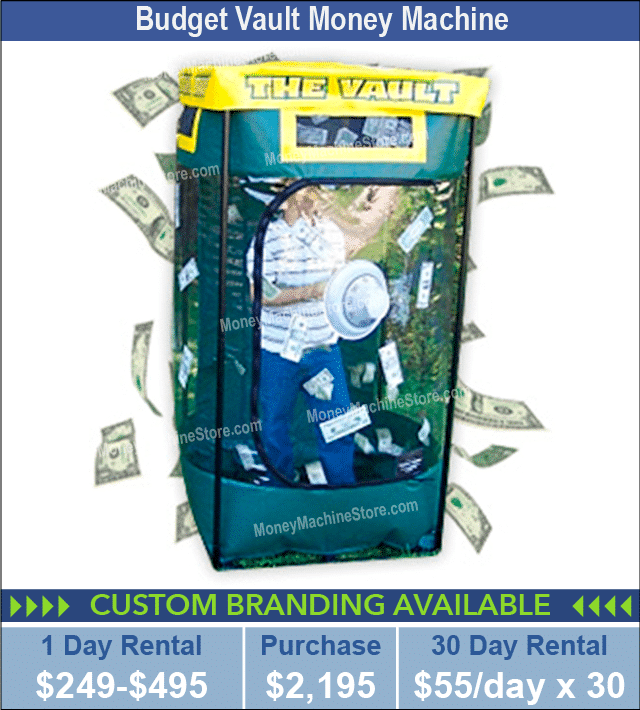 Our Vault Money Booth is a versatile marketing product. 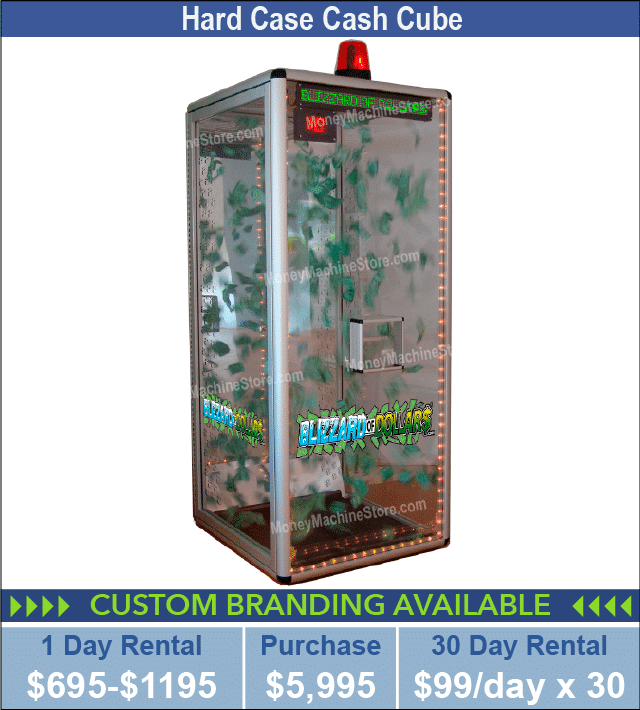 We have proven successful results with our money machines at employee appreciation events, in-house sales meetings, or conferences to build employee loyalty. These events give you the chance to give back to your top salespeople that are earning top commissions for your company. Expect morale to boost, high productivity, and high sales. Using cash as a gift is a great incentive. Putting vouchers, gift certificates, or coupons in the customized money machines ensures that participants will return to your company to use them. That means significant ROI for you. 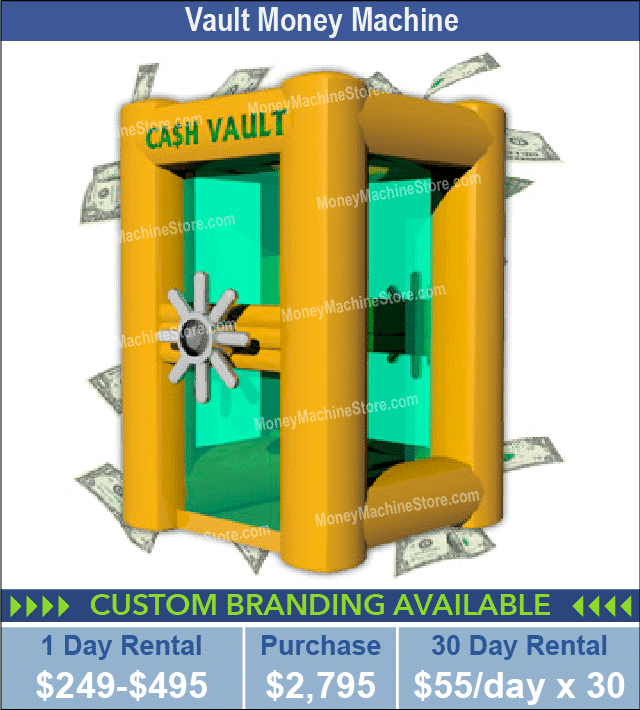 The cost of renting or buying one of our hard case or inflatable money vaults is very little, compared to the amount of money you’ll make. Your Dallas, Fort Worth, or San Antonio audience is sure to enjoy and be pleased with any promotional gift that you offer. They’ll remember you merely by the excitement your cash blower generates, not just by winning from one. That’s efficiency at its best. These promotional products and more are located at www.tradeshowattractions.com. Branding. It’s what makes people remember your company. Your logo, your colors, your brand. We want to get your name out there. And, with one of our custom-made rentals or purchases, you can do just that – with big crowds cheering on participants. The noise from the crowd alone will attract potential customers. Whichever enthusiasm-building promotional product you choose to use for your next event, our team will design it to make your company stand out. 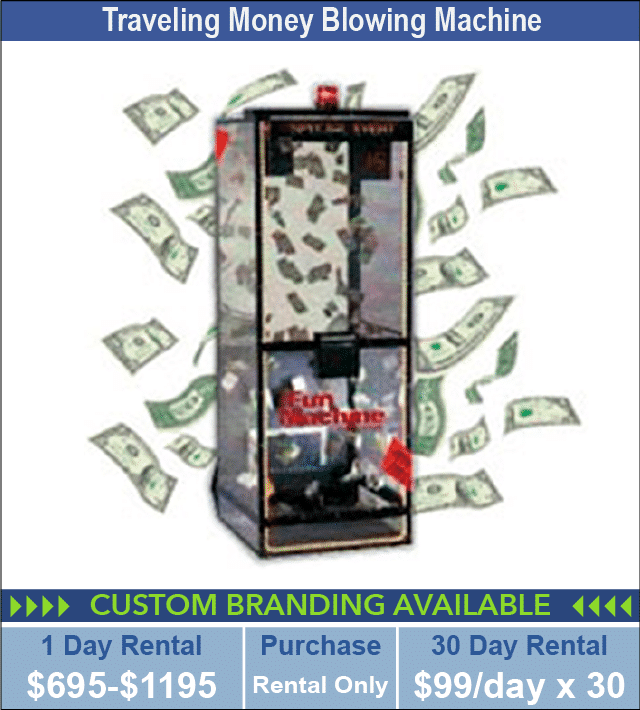 You can custom brand any one of money machines or promotional products so that your rental or purchase is not generic. That gets your company’s name out into the market in a fast and easy way. Big ROI, high employee morale and productivity, or large donations are the result you get when you get custom branding on one of our money cubes. You and your company will generate so much excitement that participants won’t be able to resist buying your product or service, working harder than ever before, and donating lots of cash. Everyone uses or at least knows about social media. These days, you really can’t do business without it. It has become an integral part of any marketing plan. 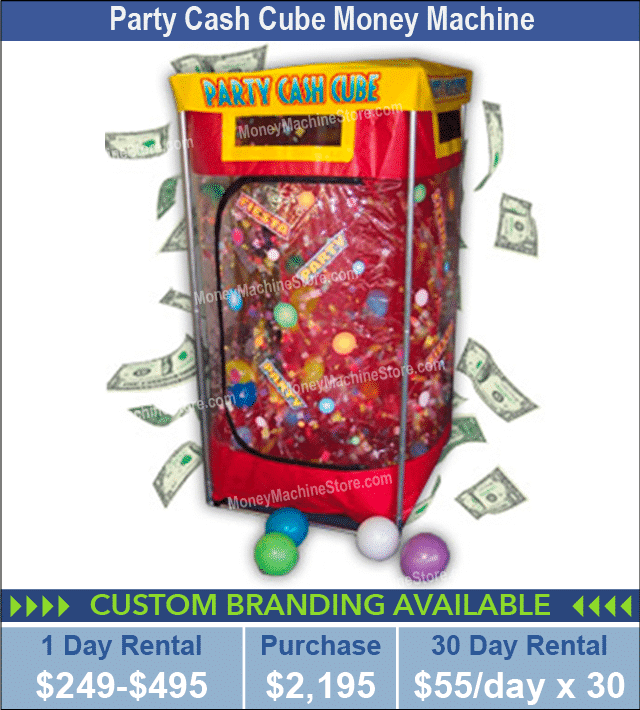 Using our cash cube money machine in your own social media pages, including your company’s website, Facebook, YouTube, Instagram, SnapChat, Twitter, or any other social media outlet, will increase your audience to new heights. Generate a buzz about your tradeshow, fundraiser, or employee-appreciation-day on social media even before the day of the event. Video is an integral part of social media. You really can’t capture an audience’s attention without it. You can use this exciting marketing promotion on your social media by merely placing a quick video of the cash blowing around in one of our money vaults. After all, who doesn’t want to see some money you can grab blowing around freely? Think of the excitement you’ll generate. Not only will potential customers flock to your event after seeing your easily-produced videos of the frenzy of fun, but you can also be sure participants will take videos of the thrilling winnings. They’ll be pulling out their phones, capturing every moment of your marketing promotion, and post them on their own social media pages. As a result, more potential customers will either go to your event or make an actual purchase from your company just by seeing all that you have to offer. The more videos posted, the more ROI for you. That’s the result. What city in Texas is your business? Dallas? Fort Worth? Houston? Any Texas city, or even any city across the United States, you’re sure to find our money blowers. We have our cash cubes available in all states, including major and minor towns. 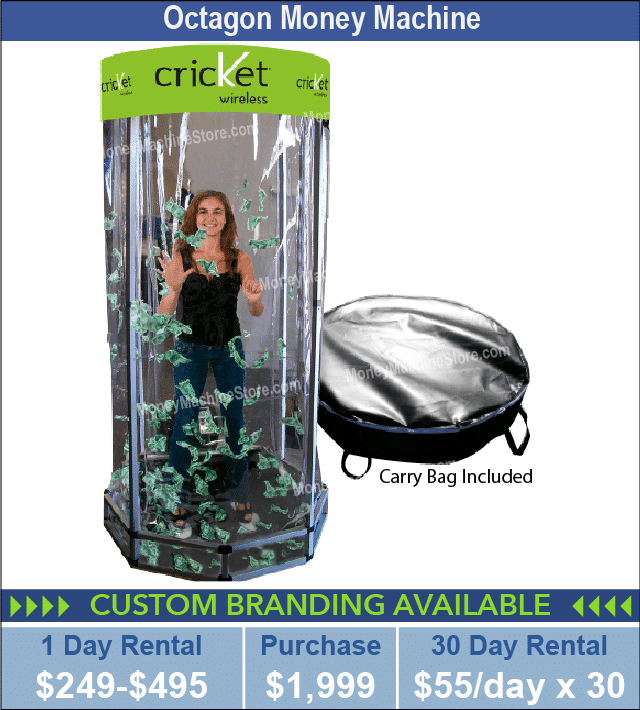 Our money vaults are used as the primary marketing tool across Texas and states throughout the U.S.
Any city you choose to have your event, our featured Blizzard of Dollars® Cash Cube Money Machine or any other of our money vaults or promotional items is sure to build up a buzz about your company and generate the ROI you’re looking for in a marketing plan. An endless crowd is what you get when you use one of our money vaults at any of these events. Don’t just think casinos or convention centers, think out-of-the-box for your next affair. These, of course, are just a few unique ideas for Texas events. Call us today at 1-214-628-0000 if you’re uncertain about where to host your event or these event spaces don’t match your needs. We have lots of ideas about more event spaces and can customize your promotion to create great brand exposure for whatever event you choose to attend. Your thoughts and our ideas lead to great results, including large audiences at your event and a high ROI on your promotion investment. 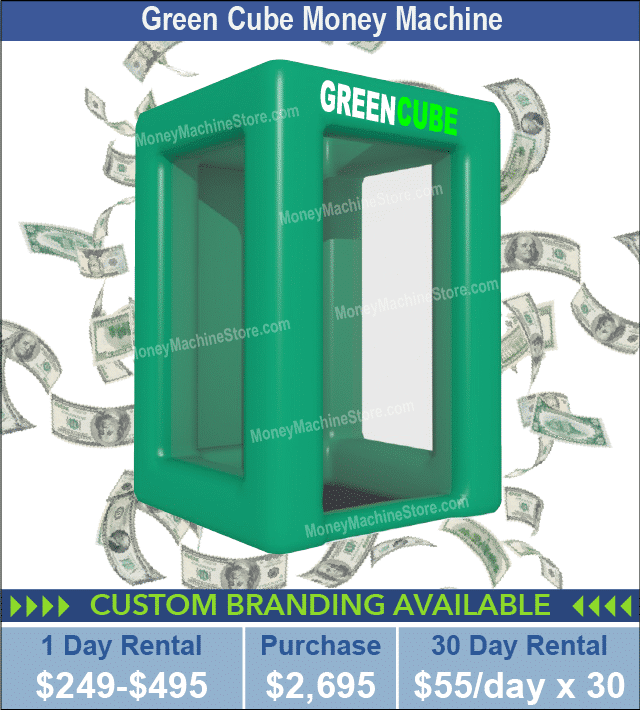 Have you decided to rent or buy a cash cube money booth from the Money Machine Store? We’re waiting to hear from you. We have great ideas and lots of different money blowers and other promotional products. Call us now at 1-214-628-0000 and speak to one of our knowledgeable and friendly customer service representatives. Our reps not only have great ideas as to which event to hold your promotion, but they also have great information about each city in Texas, like Houston, Dallas, or San Antonio. They can tell you where and how we deliver our money vaults, which types of activities you can use a cash cube machine, and the different kinds of promotional prizes you can put in the device. Allow us to help you plan your marketing promotion. If you think any of these is the right fit for your event, inquire with one of our customer service representatives. Is renting the best option for you? Don’t worry about branding. 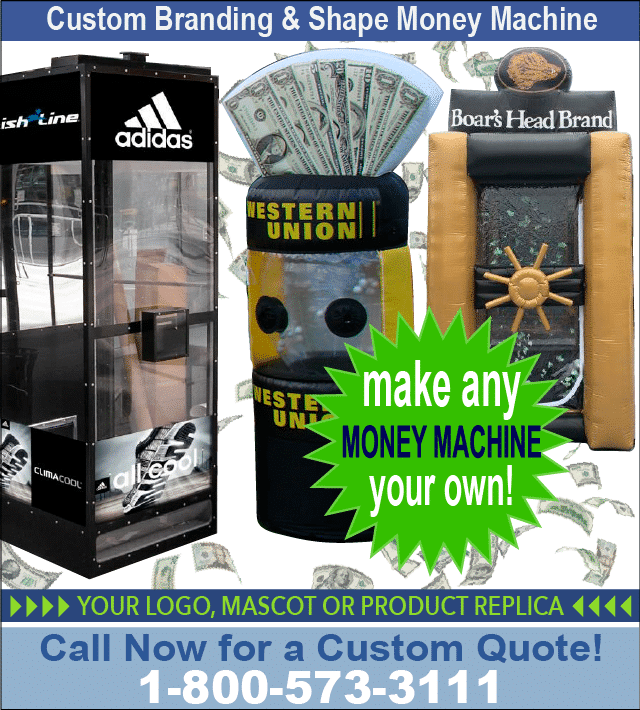 We can customize any of our money booths or promotional products with your logo. That gives you the boost you need to sell your product or service. Participants and on-lookers will recognize and remember your brand, giving them the opportunity to go back and buy. That means your small investment in renting one of our cash blowers or other promotional items will provide you with a significant ROI. The Money Machine Store has many options. And, choices are what you want. Call us now at 1-214-628-0000 and let’s work together to make your event an eye-opening success. Rest assured that we deliver on time, every time you place an order with us. You won’t have to worry about your cash cube money machine not being where you need it to be when you need it. We deliver anywhere in Texas and throughout the U.S.
We’ve trained our drivers with the skills they need to deliver your money cube machine intact and without any scrapes or flaws. It’ll be delivered how you see it on our website – bells, whistles, and all – to give you the ROI you’re looking for in a promotional marketing tool. Call us at 1-214-628-0000 now. The Money Machine Store wants to hear from you, listen to your ideas, and offer some of our own. Together we can create your event to be the most profitable with the highest ROI. We promise our cash vaults will stop traffic, draw people to your tradeshow booth or conference table, and give you an ROI that you not only want but expect. We also promise to deliver top quality marketing products on time, whether it’s in Houston, Dallas, San Antonio, or any other Texas city. 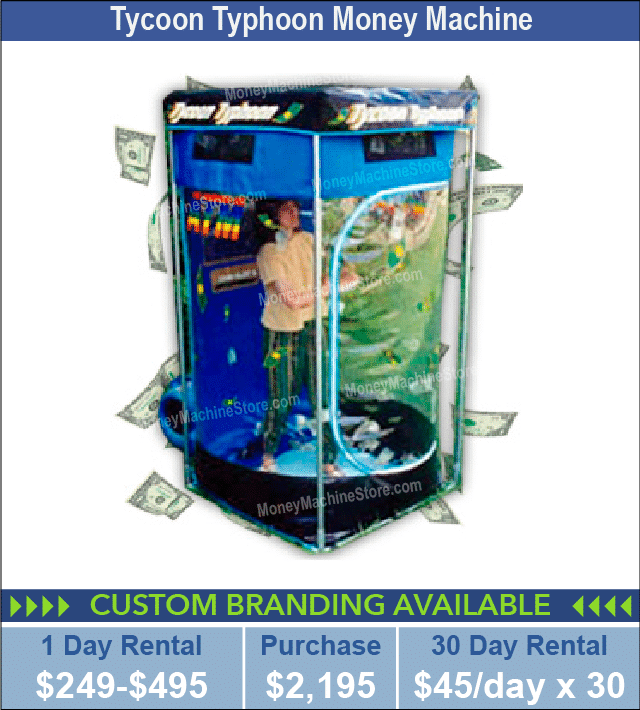 The Money Machine Store is your ticket to being successful at your next event. Let us help you make it grand.